Something wonderful has been happening in our Athletic department aside from the obvious team goals and accomplishments within the sports. With the support of the athletic directors, a program they are calling the Chaplain Corps is being formed to more fully incorporate the Savio mission of forming servant leaders into the athletic programs. 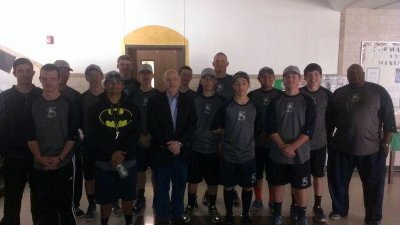 The Chaplain Corps is being developed by Head Baseball Coach Mark Sloat, some of the other coaching staff, and our Director of Formation and Ministry, Mr. Chris Ochoa, along with a core group of students: Seniors Chris Gray, Chizi Ibizum, Ashlee Keeley, Nick Zamora and Junior Calvin Nazareth. The mission of the Chaplain Corps is to assist student-athletes in becoming servant leaders and disciples of Christ. Striving to integrate their Catholic faith into their everyday lives through athletics, their relationships with others, and community service. Coach Sloat: "Our athletic directors attended the ‘Play Like a Champion’ conference at Notre Dame last summer and came back with a lot of good ideas and resources for beginning this idea. We have come up with "building blocks of success" for living our faith on and off the field. This is the foundation towards our success... we want this to be the model for all sports programs at Savio and we hope to inspire all of our sports programs to participate." Before their matchup against Reagan High school, the team spent over an hour in the Savio chapel with Deacon David Ochoa where they talked and prayed about what it means to be a Christian athlete and how they can be competitors on the field, but after the game still be brothers in Christ. After the game, they invited the other team players to pray together with them. 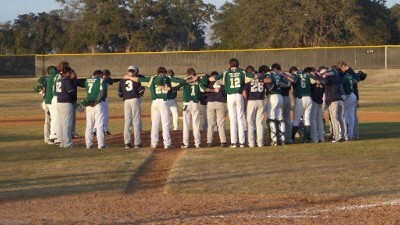 It was exciting to see players from a public school team eager to join our players in prayer. What inspired you to be part of this program? Coach Mark Sloat: "Initially, Chris Gray came to me for ideas on ways for them to be leaders. However, I'd be lying if I didn't mention Tom Bierschenk, one of our many supportive parents and benefactors. Tom never asks for anything and is always giving back to his church, his family and supporting Catholic education. He sees a need and wants to help in any way. He doesn't want a plaque for his efforts or any kind of medal; he just truly wants to help. Even if he's on crutches. Every surgery I have had, I ask myself, would Tom slow down? He embodies what servant leadership is." Chris Gray: "I'd like to establish the program so that kids have an easy and enjoyable way to be involved with their faith and their school community." Nick Zamora: "St. Dominic Savio has helped me to strengthen my faith over the past four years. I wanted to give back to the Savio community by helping student athletes to integrate their faith with the sports and activities that they love." Assistant Baseball Coach Dove: "1st ever Chapel and I loved it! Thanks Mark Sloat, Deacon Ochoa and Nick Zamora. Much needed!" What goals do you have for the baseball team as you incorporate the Chaplain Corps program? Coach Sloat: "Senior Nick Zamora has been the pioneer for the baseball program. He and I meet weekly about how we can continue to inspire the rest of our programs and the baseball team. It's my goal that they learn the game of baseball and how sharing your faith through sports can help spread God's word and inspire others to do the same. At the end of the day that's a bigger win than a walk off homerun."